Two-and-a-half years ago we published a handy guide on how to hack an electronic road sign. 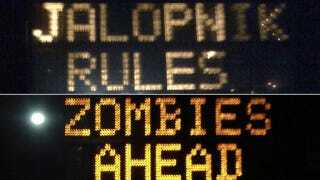 Since then, America has found itself drowning in a sea of zombie warnings — and Jalopnik has become the unofficial whipping boy of the highway Lite-brite hacking community. Look, we know local news stations like WKRC in Cincinnati has to sensationalize everything and anything in order to frighten old people into staying up late to watch the 6:00 PM news. Be that as it may, that's no reason to demonize us here at Jalopnik. Especially because every local yokel with an antenna — WKRC's Rich Jaffe, included — seems to miss one important thing: The reason road signs are still being hacked is because hapless lowest-bid Department of Transportation contractors aren't protecting their screens from zombified hordes with a simple Master-lock. And we'll continue to spread that important message until they secure their damn signs — no matter how much the idiots at local news stations call us a "hacker website." They're stupid enough to think that's some kind of an insult. That said we still must remind you kids not to try this at home. But if you do, definitely don't write "Jalopnik Rules" And if you do both those things, definitely don't take pictures and send them to us at this email address.